Yesterday, while I was at work, the grandma baton was passed. Jen's mum landed in New York and my mother headed for the relatively quiet borders of Rhode Island. The babies had spent the bulk of the day being extremely gassy and miserable despite everyone's efforts to soothe them. There is nothing like the peaceful transfer of power between grandmas. It reminds you what is truly great about this nation. Today I returned home to find a similar sight. Both babies were a gassy mess and nearly inconsolable. While they attempted to calm the Wombats I went over this week's farm share which, somehow, Jen had managed to find ten minutes to go pick up. 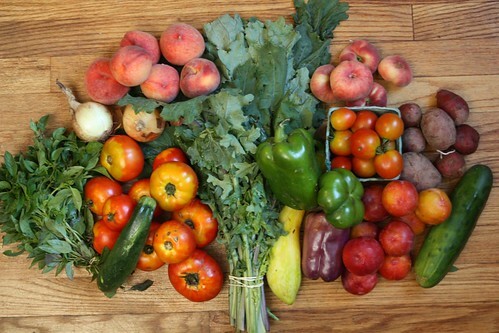 This week we got three pounds of tomatoes, a basket of cluster tomatoes, a pound of squash, a cucumber, lemon basil, two Walla Walla onions, large Bell peppers, Red Russian Kale, New Red potatoes, donut peaches, Venear plums, and peaches. Jen took Elliott out in his inaugural Baby Bjorn adventure to go to the corner store and buy a single lime. Unfortunately the store is on some sort of summer break, like everything else in our town. 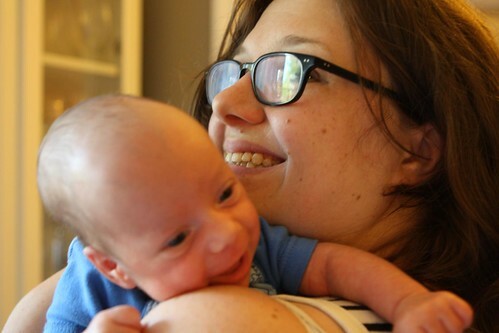 It was not wasted time, however, since Elliott's new thing is that he shrieks when anyone other than his mother picks him up. This means that the rest of us spend most of our time snuggling and feeding Martin with Jen is tethered to little Elliott. While the Wombats were wrangled I put out this Mittica Nuvola di Pecora. I don't know what that means but I'm assuming the rough translation is: "tasty raw milk cheese." Jen requested a second Monday Nicoise salad tonight. 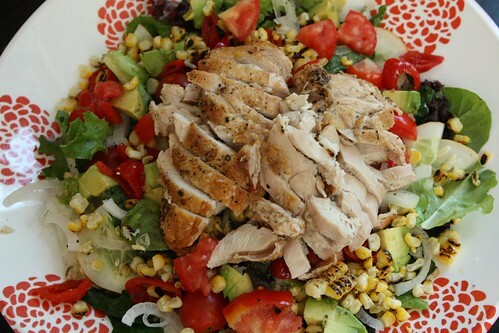 Instead I made this incredibly un-Nicoise salad with pan roasted chicken, peppadew, Walla Walla onion, grilled corn, avocado, tomato, kale, mixed greens, olives, lemon, and olive oil. For what it lacked in Nicoiseness it more than made up for in goodness and cleaning-out-the-fridge-ness. 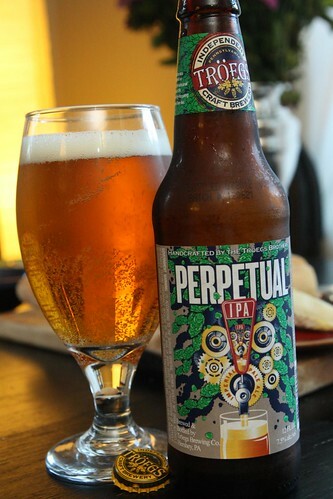 As an accompaniment I had this Perpetual IPA from Tröegs Brewing Company. For some reason I expected this to be very similar to Nugget Nectar but it ended up being a much more perfumy (and oniony) IPA. I bought several bottles because I know Jen's recent tastes are that she likes a very hoppy IPA. Because she is a hipster. She also only listens to music on vinyl. Last night we watched the closing ceremony for the Olympics. Jen's mum hated it almost as much as the opening ceremony. I found it rather lacking as well. 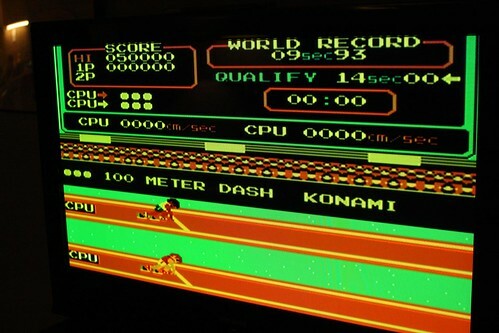 Tonight, with the Olympics behind us, I was missing the thrill of sport so I fired up the Nintendo and got to work. 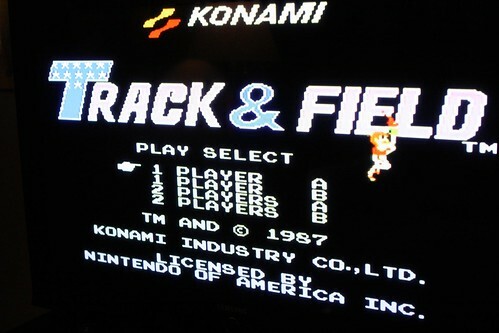 It was like a breath of fresh air playing Track & Field. I played by the rules and did not grab a battery to cheat by raking it over the buttons. Nope. I did not wish to sully the dignity of these games in such a way. I think this may have been even more enjoyable than watching the real Olympics. I didn't have to suffer through NBC's embarrassing, lowest-common-denominator coverage where they explain to us dumb Americans about things we've never heard about before such as World War II, tea, and William Shakespeare. And I got to set a new world record in the high jump. Yup. Overall a pretty good night. Labels: babies, beer, Dinner Guests, How'd we use it?, salad, video games, What'd we get? 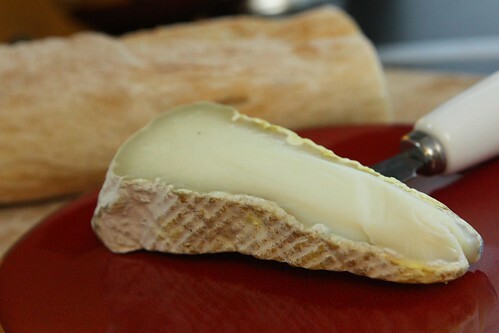 Pecora means sheep, so that cheese name has to do with sheep's milk. Oh, my poor little Elliott. My heart is sore thinking about his distress. Thank goodness for his mom.